Jakarta Governor Anies Baswedan led a ceremony for the upcoming presidential election in the Banteng Field, Pasar Baru, Sawah Besar, Central Jakarta.
" Show you maintain integrity by not pawning self-esteem from all forms of gifts"
It was attended by General Elections Commission (KPU) Chairman, Arief Budiman, Jakarta KPU Chairman, Betty Epsilon Idroos, and Election Organization Ethics Council (DKPP) members, Jakarta Election Supervisory Agency (Bawaslu), as well as organizers of election at sub-district and urban village levels, as well as polling stations (TPS). Anies began his speech by explaining the history of the formation of the state system of Indonesia. "When this republic was established, all agreed to the formation of the state through the system. And today we gather to do what started the founder of this republic, which is to prepare the government for 2019-2024," he expressed, Sunday (4/14). 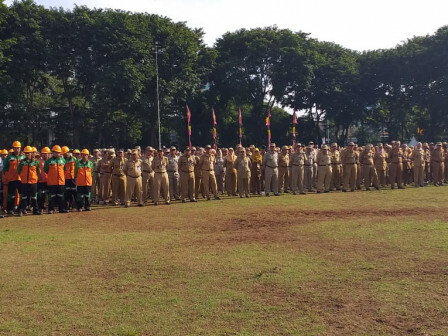 He also told them to maintain integrity and solidity in order to smoothen the election in Jakarta goes accordingly the principles of direct, general, free, secret, honest, and fair (Luber Jurdil). "Show you maintain integrity by not pawning self-esteem from all forms of gifts thus Jakarta can be an example in implementing elections with integrity," he asserted. Even his party he would always support whatever the KPU needs, including the place for counting the votes. "We will lend our sport halls (GOR) for vote counting," he uttered. His ranks were also urged to work as well as possible during the voting, including by ensuring that all needs and facilities in the field are met. "So let's maintain trust, honor and show that our city can be an example of a good election," he closed.